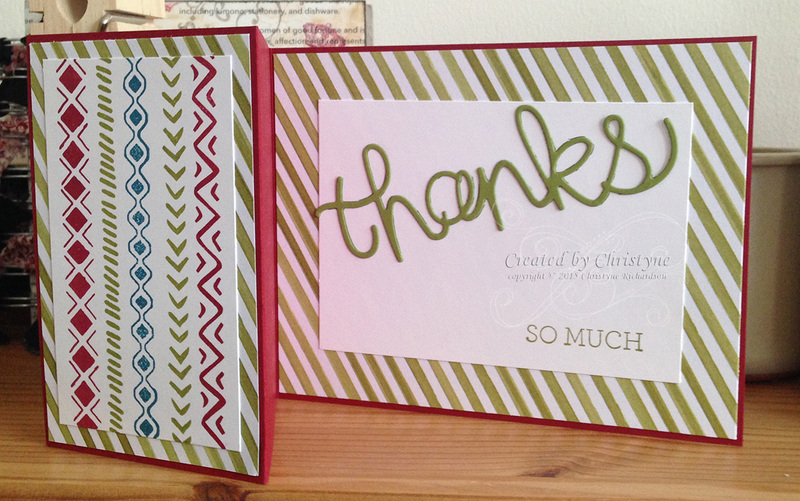 Recently, Stampin' UP! 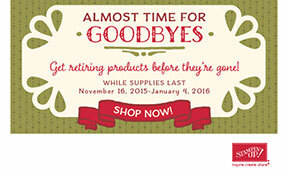 announced that there would now be retiring lists for each of the catalogues throughout the year. As a demonstrator, this is great news as it allows me to sell off retired product immediately without having to wait a year for the next same catalogue to be published. As a stamper who loves her stuff, I'm sad. The Happy Scenes Set is retiring. :( The GOOD news is that the Hearth and Home Thinlits Dies will continue to be available through the Occasions Catalogue and you're just going to LOVE the new set that goes with it! Yes, I've seen it. No, I can't show you. Sorry. So...you can either bundle it now and have a stamp set that you can use all year...or bundle it on January 5th, 2016 and have an equally amazing set to play with. SO many options! 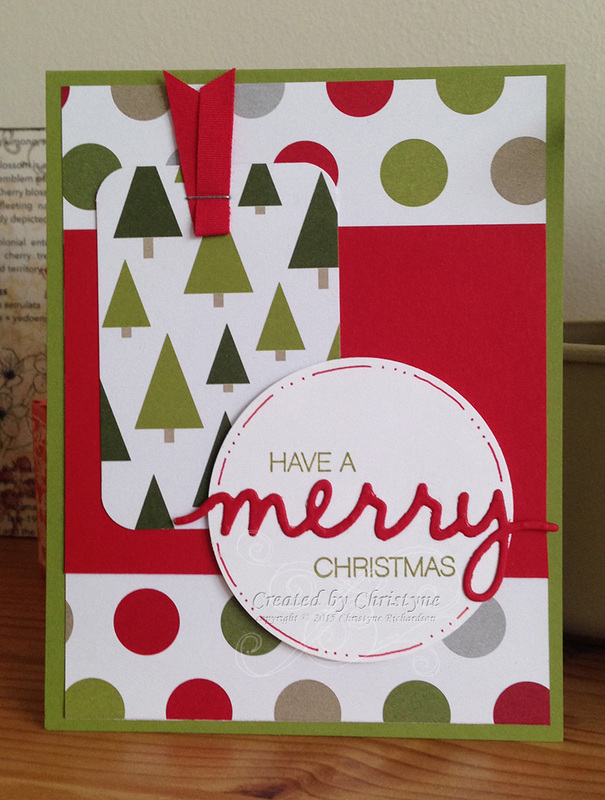 Today's card (which we'll also be doing in class on Dec. 5th), started off with a base of Cherry Cobbler Cardstock. I added a layer of Very Vanilla and then a layer of Home for Christmas Designer Series Paper. Banners were created using Cherry Cobbler and Mossy Meadow Cardstock. 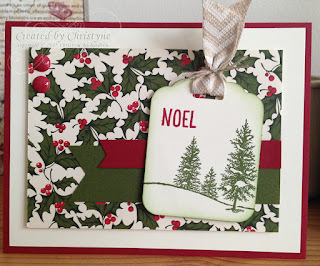 I created a tag using Very Vanilla Cardstock and stamped the tree image from Happy Scenes using Mossy Meadow Ink. The "Noel" was stamped in Cherry Cobbler Ink. I added a length of Natural Chevron Ribbon which was tied with a piece of Linen Thread. The tag was then attached to the front of the card using Stampin' Dimensionals. The finishing touch was two Home for Christmas Enamel Dots. You know how that happens, right? You start off in your email and then a link takes you to a blog and then that blog takes you to Pinterest and then Pinterest takes you to another blog and then...well, you know how it goes! So...on a recent trip around the internet, I discovered a new challenge blog called the Global Design Project. They're on week #11, but I decided to go back to week #1 for the colours I used on today's card. The colours were: Smoky Slate, So Saffron and Pink Pirouette. So Saffron and Pink Pirouette always make me think of baby cards, so that's the direction I took. How to incorporate Smoky Slate though? Stamp it off, of course! You can *barely* see it behind the sentiment on the tag (I stamped off twice) and on the hangers (I stamped off once). It's soft and muted and goes perfectly with the other two colours! I started off with a So Saffron base and added a layer of Very Vanilla. Then I cut a piece of Pink Pirouette and ran it through the Big Shot using the Softly Falling Textured Impressions Embossing Folder, which you'll be pleased to know is NOT retiring from the Holiday Catalogue and is in fact featured on pages 8-9 of the Occasions Catalogue. The label on the front started out being a Christmas tag for my upcoming class on Dec. 5th, but I just didn't like the way it was coming together...so I repurposed it and am THRILLED with the result! The corners and ribbon slots were punched with the Curvy Trio Corner Punch, which will also be returning in the Occasions Catalogue. I stamped the little onesies in So Saffron and Pink Pirouette and cut them (along with the hangers) using the matching die set and my Big Shot. You can purchase the Baby Bundle HERE and save 15% through our bundle and save opportunity. You can check out the rest of the crew here. Get those fingers ready to FLY!! It's time for the Stampin' UP! Online Extravaganza! There will be a ONE DAY sale on Monday (these items will only be available at the discounted price on Monday) and ANOTHER ONE DAY sale on the following Monday, November 30th. There is a LIMITED QUANTITY of each item available at the sale price, so you'll want to figure out what you want and order it ASAP. I'll post the list of what will be available in TOMORROW'S blog post, so get your pen and paper ready. When placing your online order, be sure to use hostess code: KG6JCVP9 in order to be eligible for FREE STUFF! It's a MOJO kinda day! Well...actually, it was a MOJO kinda day on Monday which is what got me started creating all the Christmas cards for my upcoming class on Saturday December 5th (you're coming, right? ), but I had some other awesomeness to put up first. So...this had to wait till today. And, if you're keeping track...only 35 more days till Christmas. That's just five weeks...no pressure! Today's card is quick and easy. so you should be able to whip up a batch of them in no time flat. 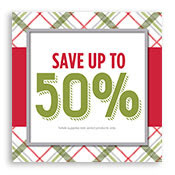 Especially if you take advantage of my "cut to size" offer when you purchase your card making supplies from me. That's right! When you purchase everything you need to create one of the cards I've featured, I'll personally cut all the pieces to the required sizes. All you'll have to do is stamp and assemble. You'll start off with a base of Old Olive Cardstock and add a layer of Designer Series Paper from the Merry Moment Pack (which, unlike the paper on Wednesday's card, should be available until April of 2016). The next layer is Real Red Cardstock and the "tag" was created using a different DSP from the same Merry Moments Pack. Then I punched a 2 ½" circle and adhered the word "merry" which I cut using the Christmas Greetings dies. 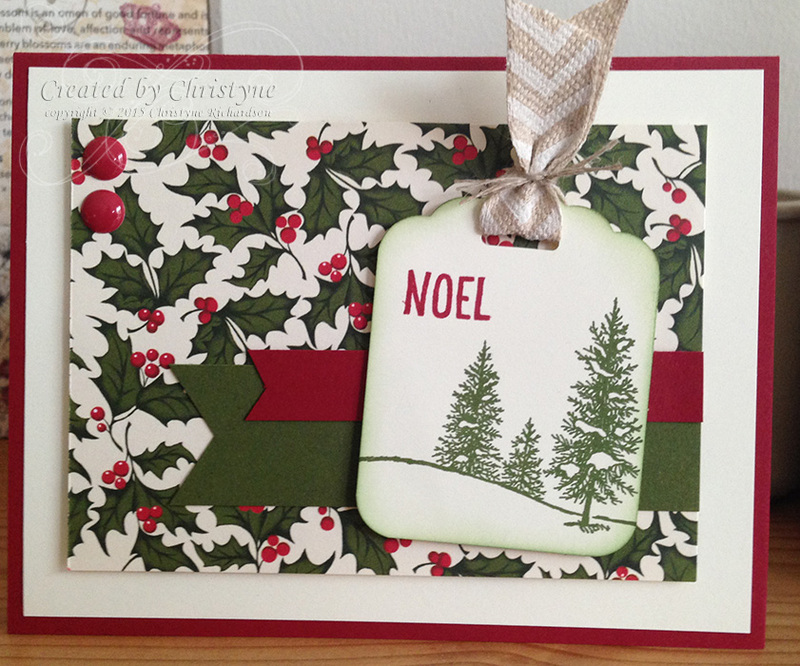 I then stamped the rest of the sentiment using the Holly Jolly Greetings Stamp Set. These two items can be paired together and purchased as a BUNDLE for a savings of 15%. The circle was adhered to the front of the card using Stampin' Dimensionals. Good morning and Happy Wednesday! If you're checking the calendar, there's only 37 more days till Christmas! YIKES! Today's card is NOT a Christmas card (there'll be one later this week), but it's what I like to call a WYSIWYG card - which basically means I use whatever supplies are in my immediate reach to create. Since I was working on Christmas cards, this card is a Real Red Base with a layer of Designer Series Paper from the Season of Cheer Pack currently available in the Holiday Catalogue (but ONLY while quantities last!) and the Bohemian Borders Stamp Set available in the annual 2015-2016 Catalogue. I also used the Crazy for You Stamp Set and Dies (again, in the annual catalogue). Old Olive was used for stamping the sentiment and it was used along with Island Indigo and Real Red to stamp the border images. 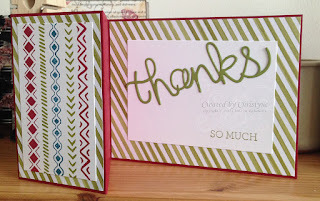 I ran the "Thanks" sentiment through the Big Shot and adhered it with our new (and simply AMAZING) fine tip glue pen. 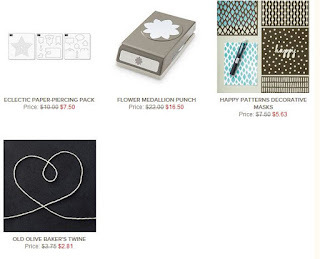 Get a jump start on your last minute Christmas gifts/cards with this week's deals. Click HERE to start shopping now and be sure to use Hostess Code: KG6JCVP9 before checking out to be eligible to win an exclusive never before seen Stampin' UP! set or a $25 voucher towards your next order of $75 or more. There's a new retiring list in town! If you were at class this past weekend, you got to create this adorable card. If you weren't, you get to see it today! I created this card based on the sketch over at the Paper Crafts Crew. 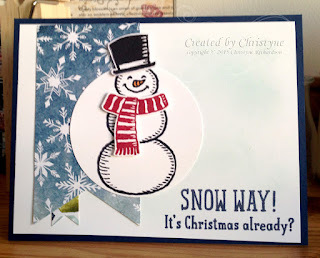 I just love, love, LOVE the Snow Place Stamp Set and coordinating Snow Friends Framelits. When I first saw it in the Holiday Catalogue, I just KNEW I had to have it. It was the VERY FIRST thing I ordered! Today's card features the Snow Place bundle and Designer Series Papers from the Season of Cheer DSP Pack. Our adorable snowman was stamped using the NEW Basic Black Archival Ink. If you've been waiting for a TRUE black that performs beautifully on any of our paper surfaces, then THIS is the ink for you! I've already tested it out on watercolour paper and it doesn't run, no matter how much you saturate the paper. It's perfect for colouring with our markers too. It's available in Holiday Catalogue right now! To add some contrast between the Whisper White circle and the Whisper White background, we sponged on some Soft Sky Ink. I hope you like this quick and easy little Christmas card! It's Tuesday! That means it's time for the Weekly Deals! My favourite? Probably the Old Olive Baker's Twine! I love that stuff and use Baker's Twine a LOT!